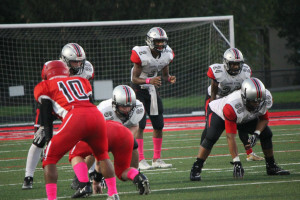 The Cardinal Ritter Raiders played an away game against the Park Tudor Panthers last Friday. In a spectacular show of redemption, the Raiders triumphed over the Panthers, dominating on the field all game long. The drive there might not have been long, but our boys in red played like champions and gave the Raiders a much needed victory. The final score was 47-13. The Raiders won the coin toss and chose to receive. 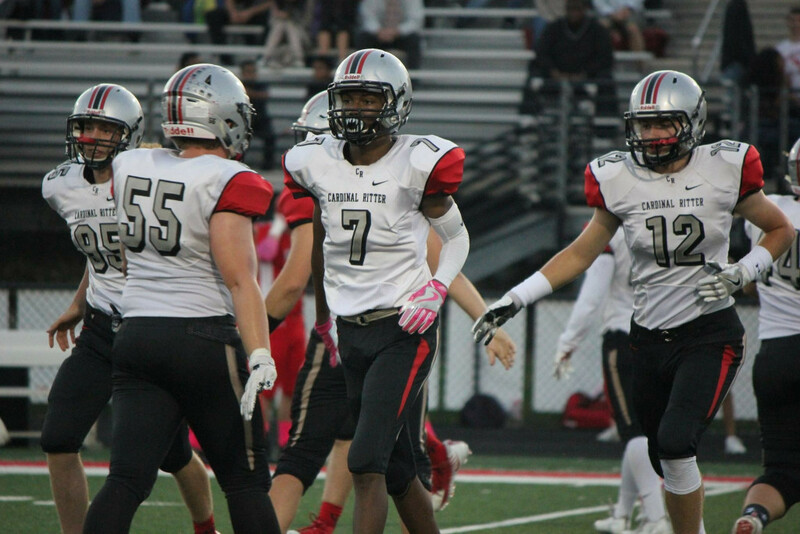 Park Tudor kicked to Cardinal Ritter and Brad “Big Play” Bacon returned the ball to the Raider 49 yard line. 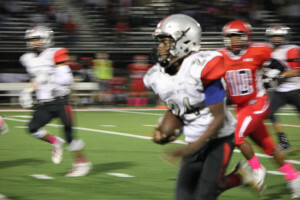 At the beginning of the drive, Darryll “Quicksilver” Roberson rushed the ball for 30 yards between 1st and 2nd down. On the next play, Marlon “Hotshot” Anderson carried the ball for a 14-yard gain. From the Panther 7 yard line, Anderson ran the ball in for the Raiders first touchdown, less than 2 minutes into the game. The Raiders gave the ball to Hotshot again, who completed the 2-point conversion, giving the team an early lead. Cam Houston kicked the ball back to Park Tudor, who returned it to their own 26 yard line. On the 1st down run, Henry “A-Bomb” Woodcock made the tackle for a loss of two. The Panthers ran the ball again on 2nd down, but were shut down by Javon “the Shield” Rodgers. After a spiked pass on the ensuing play, the Panthers were charged with holding. Facing 4th down, Park Tudor punted the ball away with 8:27 on the clock. 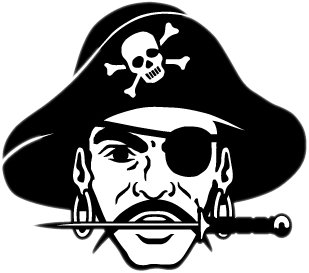 The Raiders began from their own 29. Roberson had a huge drive down the turf for 35 yards. Diomoni “Supreme” Small rushed the ball for a quick gain of three, followed by a completed pass to Kyle “Kay Pee Zee” Price for another three. On 3rd and 4, the Raiders were flagged with holding, sending them back to 3rd and 19 from the Panther 45. However, Ben “the Jet” Egenolf turned this around by catching a pass from Small on the next play for a pickup of 14 yards. Facing 4th and 5, Cardinal Ritter went for it and Woodcock caught a ball from Small for a whopping 30 yards to the Panther 1 yard line. On the play after, Roberson drove the ball into the end zone for a touchdown leaving 5:55 in the first quarter. Houston kicked the PAT, which was good, increasing the Raiders’ momentous drive. 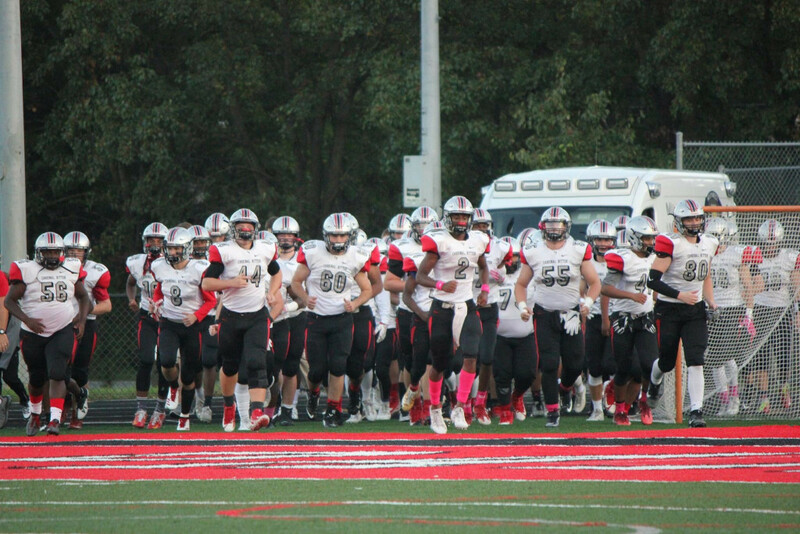 Houston returned the ball to Park Tudor, who ran it to their own 26. The Panther only managed to gain a yard on 1st down and three on 2nd. From 3rd and 6, the Panthers ran the ball, but Rodgers made the tackle for a loss of three on the play. On 4th and 9, Park Tudor attempted punt the ball, but Anderson was there to block the kick. As the ball threatened to go out of bounds, “Hotshot” dove and tossed it back in, allowing Woodcock to catch the ball and score another Raider touchdown just over a minute after their previous score. The PAT was no good, but the fans didn’t care. 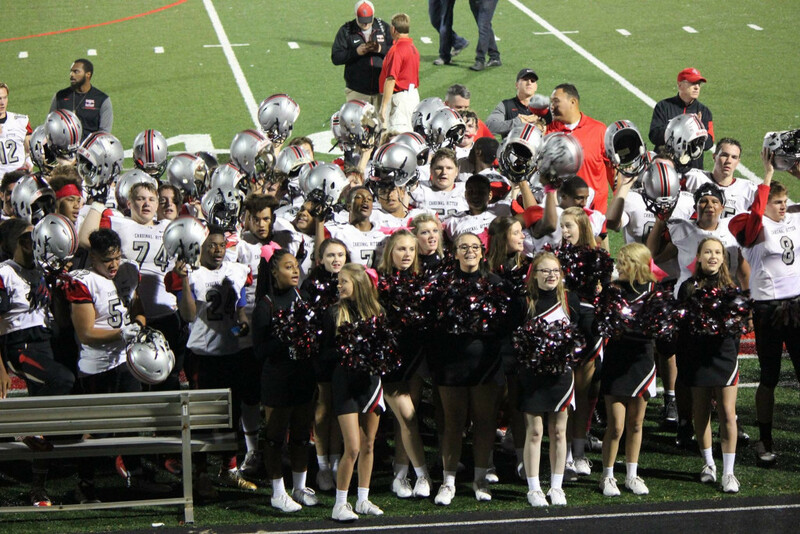 Their hearts were thumping to the beat of the Raider Fight Song. Pride flowed through their veins for our boys in red. Houston kicked the ball back to the Panthers, who returned it to their own 37 before being stopped by Eric Krumm. Park Tudor threw an incomplete pass on 1st down, but managed to gain 7 yards in the air on the next two plays. 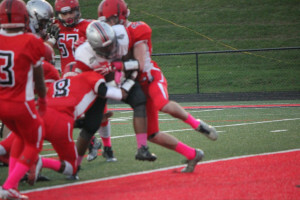 Daniel “the Slammer” Ayala and Dillion “Rube” Olejnik teamed up to make tackles on defense alongside the Raider D-line. 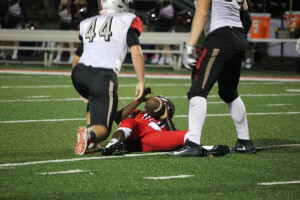 On 4th down, Park Tudor attempted to convert, but Ayala was quick to shut down the run, turning over the ball at the Panther 46 with just under three minutes left in the first quarter. Roberson carried the ball for eight on 1st down, but there was an incomplete pass on the play after. After rushing for a yard on 3rd down, Roberson was able to move the chains for the conversion with a five yard carry. Olejnik ran the ball for a big 28-yard gain to the Panther 4 yard line. With just 20 seconds left on the clock, Roberson again carried the ball in for the touchdown. The point after was blocked by the Panther defense. Houston kicked the ball to the Panthers, who returned it to their own 47 before both Aiden Robinson and Houston made the joint tackle. The Panthers managed a gain of three on the ground to the 50 yard line before the first quarter came to a close. 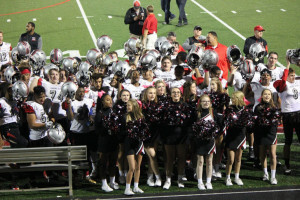 The score was 27-0, Cardinal Ritter. This was going to be a game of the ages. As the second quarter began, the Panthers picked up another three-yard run, tackled by Kendall “Demolition” Dalverny and Small. Again, Park Tudor ran the ball, but Rodgers was there on the stop, causing a loss of two on the play. Attempting to make the 4th down conversion, the Panthers passed the ball, but it fell incomplete. The ball was turned over to Cardinal Ritter at their own 49 with 10:14 on the clock. Quicksilver demonstrated just how fancy his footwork can get as he drove the ball down the field for a massive 51-yard touchdown run. The Raider fans were sent into a frenzy. This game was already better than any gladiator showdown, chariot race, or any other sporting event the ancient world had ever beheld. 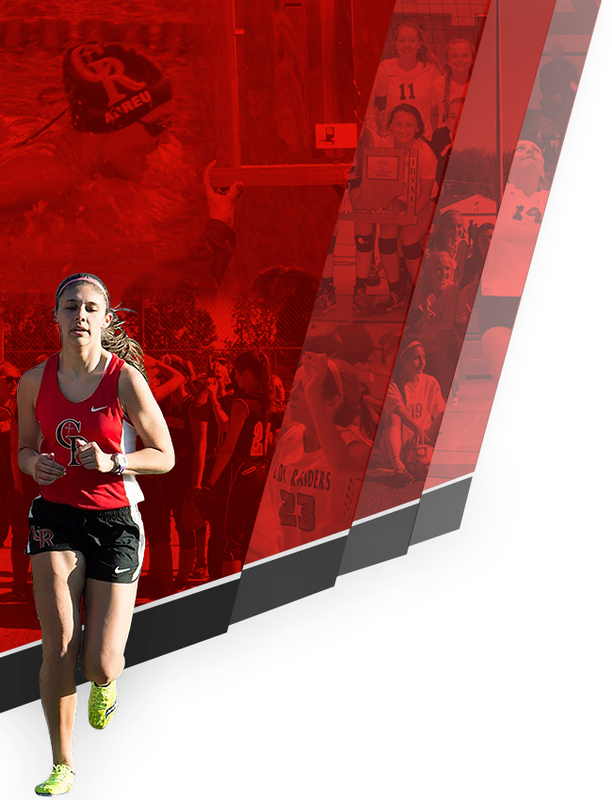 The point after was good and Houston kicked the ball back to Park Tudor. They returned the ball to their own 39 before being stopped by Tre Stubbs. 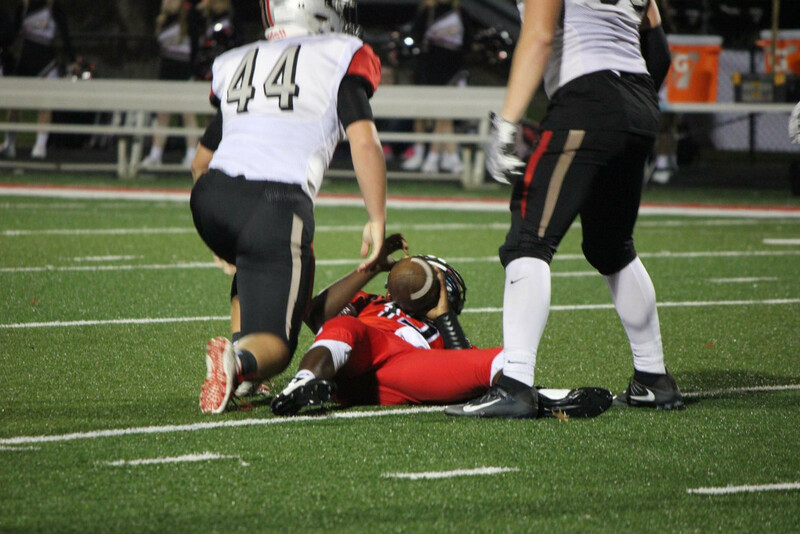 The Panther QB attempted to run the ball on 1st down, but “the Shield” sacked him for a huge loss of 12 yards. This, however, was subsequently cancelled out by a 12-yard completion on the following play. The Panthers continued passing and driving the ball down the field for the next six or so minutes. Donovan Morris, Rodgers, Woodcock, Roberson, and Jake “the Snake” Kluemper all fought hard and made tackles to counter the Panther offensive. From 3rd and 1 at the Raider 21 yard line, “Charging” Trey Hunt sacked the QB for a loss of six. 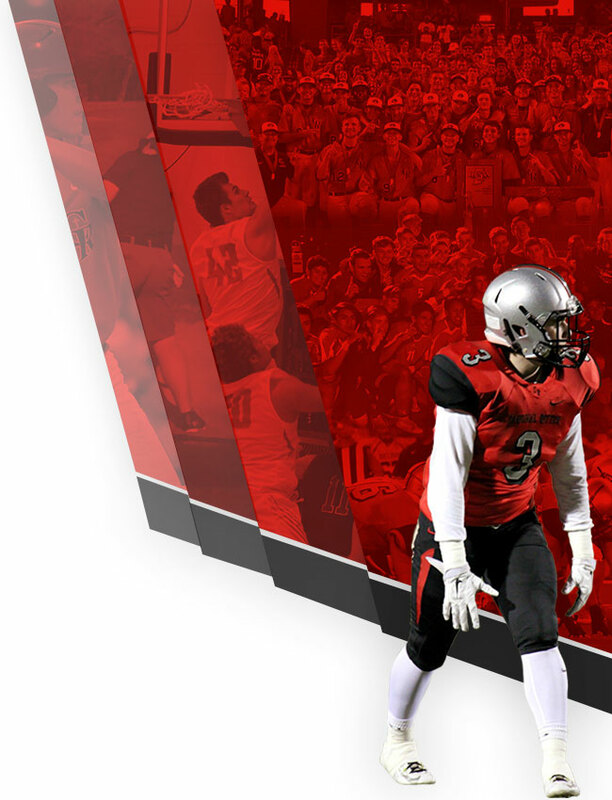 After an incomplete pass with tight coverage from Egenolf, the ball was turned over at the Raider 27 yard line leaving just 4:47 in the first half. Beginning the next drive, Roberson carried the ball for a gain of 12, followed by a rush of seven yards by Anderson. After a loss of a yard on 2nd down, Roberson again had a huge drive down the field, this time for 45 yards to the Panther 10. Roberson made a gain of two on the next play and was succeeded by an eight-yard touchdown carry by Woodcock. The PAT was good and Houston kicked the ball back to the Raiders with just over a minute left before halftime. The Panthers returned the ball to their own 28 yard line as Zach Feltz and Morris made the stop. Park Tudor passed the ball for two, but Mitchell Wilson tackled the receiver for the stop. Suffering an incomplete pass on 2nd down, the Panthers bounced back with a 70-yard touchdown run with 41 seconds on the clock. The attempted 2-point conversion was no good. 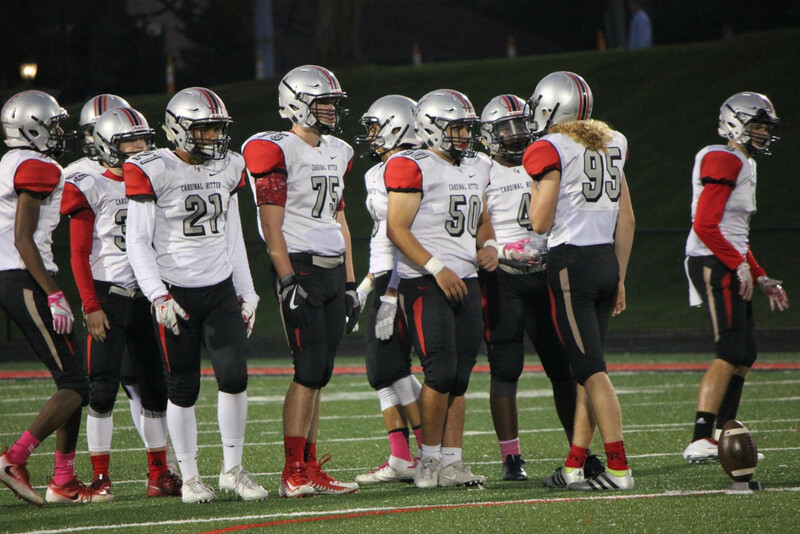 Park Tudor kicked the ball to the Raiders, but were penalized for being offsides, moving the spot of the kick five yards up. After the next attempted kick, the Raiders covered up the ball at their own 34 yard line. The Raiders knelt the ball and the clock wound down to halftime. The score was then 41-6, Cardinal Ritter. As the third quarter began, the Raiders knew they were not just playing for victory, but redemption. Houston kicked the ball to Park Tudor, who returned it to their own 47 yard line. After a gain of two on the ground, Egenolf made the tackle. The QB ran the ball for 12 on the play after and Stubbs was there for the stop. After two incomplete passes with Roberson playing coverage on the latter, the QB again ran the ball for two. From 4th and 8, the Panthers went for the conversion and managed to complete a pass for a 1st down. On the ensuing run, Rodgers was there on the tackle for no gain on the play. The Panthers threw an incomplete pass and Dalverny made the sack for a big loss of 17 on the 3rd down play. 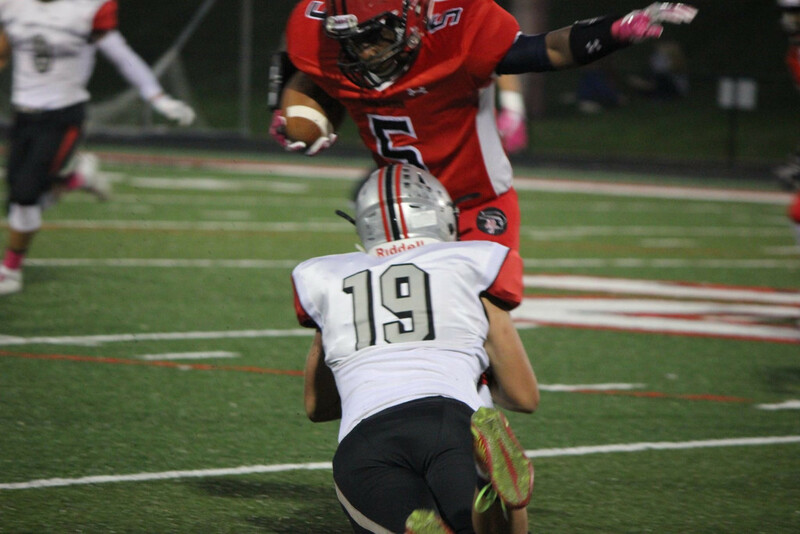 Park Tudor punted the ball and the Raiders received it at their own 16 on a fair catch with about nine minutes in the quarter. Right off the bat, the Raiders gained five yards from an offsides charge against the Panthers. Ashton Hall had the first carry, but the Raiders were penalized for holding, costing them yardage. There was no gain on the next play and Hall ran the ball for three on 2nd and 11. After a sack for a loss on 3rd down, Houston punted the ball away with 6:27 on the clock. The Panthers recovered the ball at the Raider 46 and began their next drive. Park Tudor attempted to run the ball on 1st down, but Bryce “Black and Blue” Giebel was quick to shut down the play for no gain. After a loss of two on 2nd down, the Panthers carried the ball again, but Woodcock was there on the stop, causing another loss of two. The Panthers punted the ball with 4:19 left in the third to the Raiders, who began at their own 5 yard line due to a holding penalty. 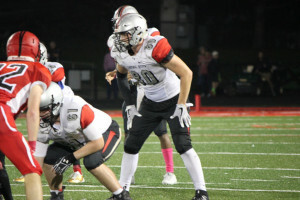 Facing losses on the first two plays of the drive, Mark Kibiridge caught a pass from Jack Henninger, but the Raiders were penalized for an illegal pass. Olejnik punted the ball away with 2:28 left on the clock, but Park Tudor was charged with roughing the kicker, allowing the Raiders to retain possession of the ball at their own 16 yard line. Wilson caught a ball from Henninger, but again the Raiders were penalized, this time for illegal procedure, costing them five yards. After two incompletions and a sack for a loss, Houston punted away the ball with just over a minute in the third. The Panthers returned the ball to the Raider 36 and Reid Swails was there to make the tackle. The Panthers ran the ball two consecutive times, but picked up no yardage on either play, with Giebel making the stop on the latter of the two. 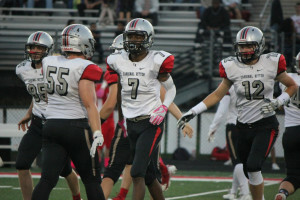 After an incomplete pass that took Park Tudor to 4th and 10, the Panthers pulled a fast one and scored a touchdown pass with the last seconds of the third quarter. The PAT was good and the third quarter ended. The scoreboard read 41-13, Raiders. 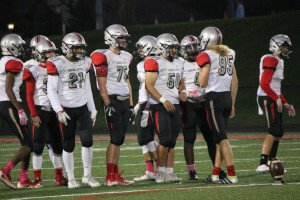 As the final quarter began, the Raiders were looking to play harder than they had before while getting some young players some valuable playing time. 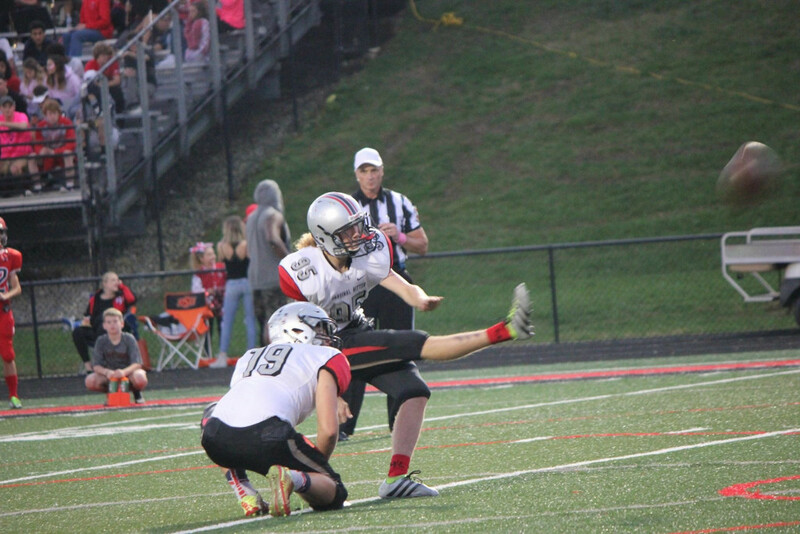 The Panthers tried to pull a fast one on Cardinal Ritter with an onside kick, but Parker Mead was quick to cover up the ball at the Raider 41 yard line. On 1st down, the Raiders were flagged again for illegal procedure, but this was subsequently cancelled out with a penalty against the Panthers for being offsides. Aiden Robinson made the first carry for a gain of two. After a fumble, Robinson recovered the ball at the Raider 40, though for a loss of three. Henninger then completed a pass to Zach Feltz for a 16-yard 1st down. Hall carried the ball for four, and after an incomplete pass, he began his charge down the gridiron. Feltz caught another pass from Henninger for three, followed by a gain of four on the ground by Hall for a 1st down. Hall ran the ball four consecutive times for 12 yards to the Panther 21 yard line. From 2nd and 9, Hall drove the ball into the heart of the end zone for a 21-yard touchdown carry with 5:17 left in the game. The PAT was no good, but again, this was not to the detriment of the fans. Houston kicked a bullet to the Panthers and Swails made the tackle at the Park Tudor 20. The Panthers ran the ball for four and Swails was there on the stop. 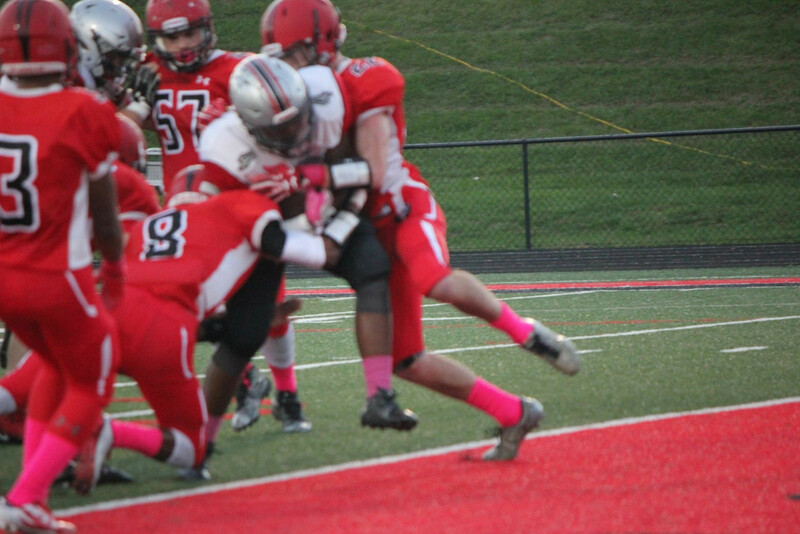 After an incomplete pass, Park Tudor attempted another run, but again Swails made the tackle for no gain on the play. With 3:40 left in the game, the Panthers punted the ball back to Cardinal Ritter, but were penalized for interference, allowing the Raiders to start from the Panther 40 yard line. Thus, Fate closed the lid on her ink bottle and set aside her quill. For the game had been decided and Lady Luck cheered gleefully on the sidelines with the Lady Raiders. Hall drove the ball for 30 yards on 1st down, followed by another gain of three on the ensuing play. The Raiders suffered small losses on the next few plays, but it was of no concern. Henninger went for the QB kneel and the game was finished. The scoreboard read 47-13, Good Guys. Winning a game and being crowned victors can be exhilarating, but glory was not what the Raiders had sought in this game. The Raiders played for a different cause, for a far more righteous purpose: Redemption. Though no Cardinal Ritter fan would ever harp on any of our boys in red for a loss, to them, a loss is a minor cut, and a cut must be healed. For them, the only healing they knew was to train harder, play better, and win. To reach the light at the end of a shadowed tunnel. The Raiders indeed earned the redemption they sought, and the Raider Nation could not be more proud of them. Roberson had the best game of his career amassing 194 yards and 3 touchdowns on just 11 carries. 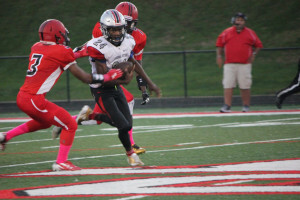 Hall showed some real promise running for 72 yards and a touchdown on just 12 carries, while Anderson added 5 carries for 30 yards and a score. Woodcock led receivers with a catch for 29 yards while picking up 7 yards and a touchdown on 1 carry. Feltz had a strong game coming up with two big catches for 18 yards. Small was efficient under center. With the strong play of his teammates, Small only threw the ball 4 times for 47 yards while managing the offense. Other than a couple botched plays, the defense was stout. 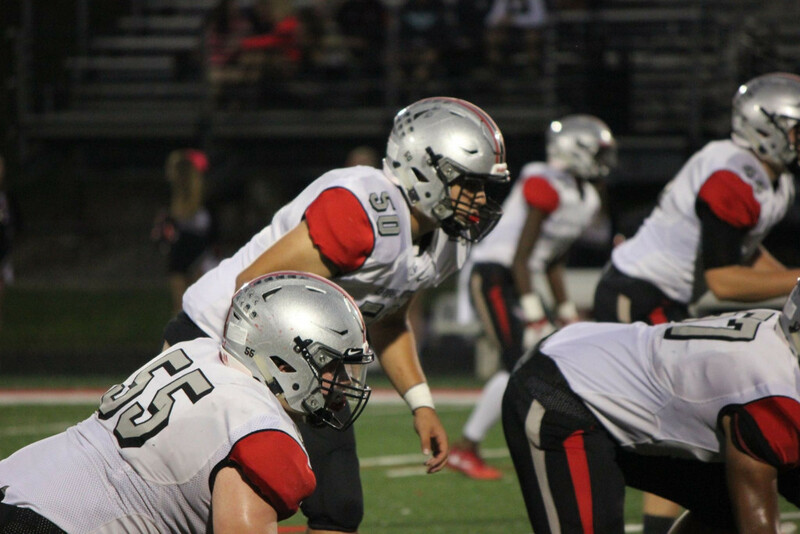 Leading the “D” was Hunt who tallied 7 tackles, followed by Kluemper and Ayala with 5 and Egenolf, and Olejnik with 4. Woodcock added 3 tackles while scoring a touchdown on defense. Cardinal Ritter will be playing a neutral game against the Rushville Lions in the first round of Sectionals next Friday, October 20. The game will be held at Marian University and since this is a Sectional event, all spectators will be charged $6 for admission. Come out and assist our Lady Raiders in cheering on our boys!